What a fantastic Iydea for dinner! However, since expanding and opening the Western Road branch, with its extended opening hours, it means you can now enjoy Iydea’s award winning food at any meal time! The vibe is the same: show casing all the main meals, sides and sauces behind glass, customers queuing and viewing, before choosing what they might like to munch. The restaurant is modern, but rustic, with lots of wood, evoking a feeling of nature and good honest grub, which is basically what Iydea is all about. In addition, it is a vegetarian only restaurant / café, which does wonders for your conscience, as well as your digestion! And before you meat loving, burger guzzling, carnivorous diners, write this place off…I guarantee, you will not miss the meat!! There’s something great about being able to see your food before you choose it. Menus can only go so far in persuading you towards a certain dish, because let’s face it, it’s not until your meal arrives that you really know if you’ve made the right choice! Being able to choose my meal based on the way it looks and not how it sounds, is a welcomed change. Joining the queue at the glass, deliberating over the selection, reminds a bit of my school days. Then I notice the variety and the vibrancy of this food – it suffices to say: it is nothing like school dinners! 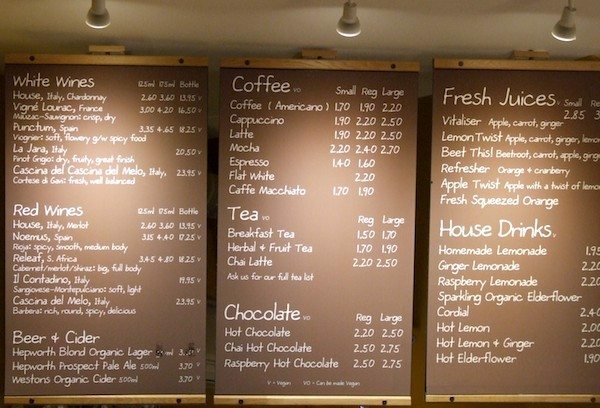 Making a decision is going to be hard; maybe this is why restaurants use menus? and confidently make my selection. The premise at Iydea is a simple one. 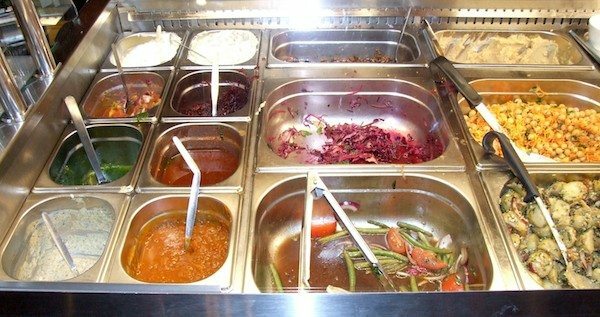 Start at one end, pick your main, choose two sides from the vegetables and salads, and finally two sauces. The mains change on a daily basis, although you will find some favourites making reappearances throughout the week. Today’s menu boasts the following: chilli bean enchiladas, goat’s cheese arancini, roast vegetable lasagne, Thai corn fritters, leak and Wesleydale sausages, broccoli and Brie quiche, vegetable Dhansak and re-fried bean roti. From this wonderful array of vegetarian dishes, fresh, tempting and ready to eat, I pick sausages, while my partner opts for the Thai fritters. 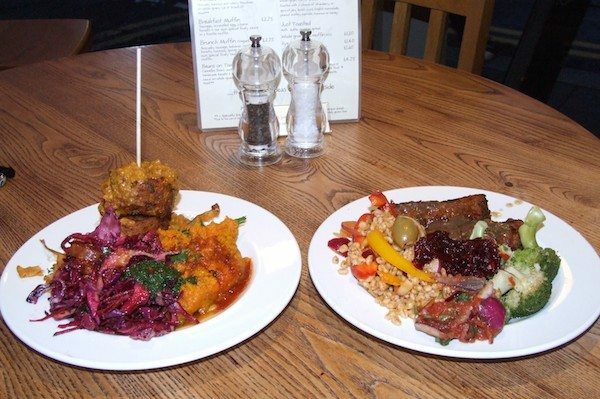 The sides look equally as appetizing: chickpeas, pearl barley, fresh veg, slaw, purees, potatoes, salad and more. The striking colours of the sauces pop from behind the glass; I am not entirely sure what each one is, but they all look great! If you are intrigued about the ingredients, do not fear, each one of these spectacular dishes, side sand sauces has a detailed description, clearly pinned above it. Furthermore, if you have certain dietary requirements, Iydea offer you a helping hand by noting if the dish is gluten free (GF), vegan friendly (V), or even if there is a vegan option available (VO). home from work, others eating in: alone or with friends. 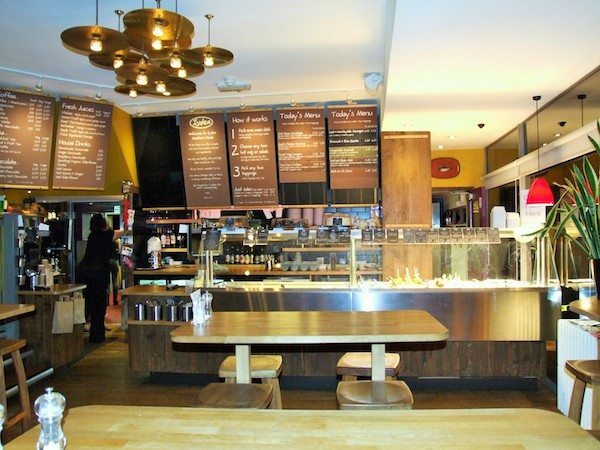 Iydea is the perfect place to stop for quick and healthy dinner. Here you would not feel self-conscious dining on your own; equally, you don’t feel out of place settling in for a few hours, with a glass of wine – like we are tonight. A restaurant and a café in harmony. Our meals are great; our plates are full! My sausages are delicious: meat-free but somehow meaty. They are just as good as some of the top quality meat sausages I have had in the past. The gravy they are served with is thick and complimentary. My sides of chilli broccoli – which retains its bite – and pearly barley with olives, pepper and red onion, add a brilliant freshness to my plate. The sauces, one of which is recommended by the girl who serves me, add extra levels of flavour still. I have chosen a salsa and pickled beetroot; when I team this pickle with a chunk of sausage on my fork, I find my magic mouthful! My partner’s Thai corn fritter comes on a skewer covered in a peanut, satay inspired sauce and is served on rice. Like the sausages, the sweet potato and chickpea fritter is filling and packed with flavour. To accompany this, he has the carrot and coriander puree – cooked in coconut oil – along with the red cabbage slaw. sweet chilli sauce adds a kick and the garlic and coriander yet more colour and intensity. We wash all this down with a large glass of white wine and bottled local pale ale. Dessert is ordered at the counter, although it is not on display. 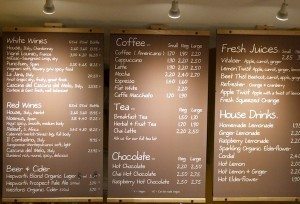 There is plenty to choose from, with many vegan options. We decide to try the vegan panna cotta, a dessert traditionally made with cream and egg whites, as it sparks a certain intrigue. The other pud is picked because an apple tarte tatin will be warm and comforting, on this cold and wet evening. Both arrive as beautifully presented as each other, bought to our table by a member of staff. My coconut, lime and coriander panna cotta is an interesting flavour combination, but not the constancy I am used to. The light, almost jelly like nature of panna cotta, seems to get lost in its transition to a vegan dessert. However, the big slice of chilli infused whiskey soaked pineapple is glorious and really livens up this dish. The tarte tatin – served with dairy free ice cream – is flaky, syrupy and sweet. Surprisingly, this time, the absence of dairy makes no difference to the flavour or creaminess of the ice cream. This dessert gets top marks! 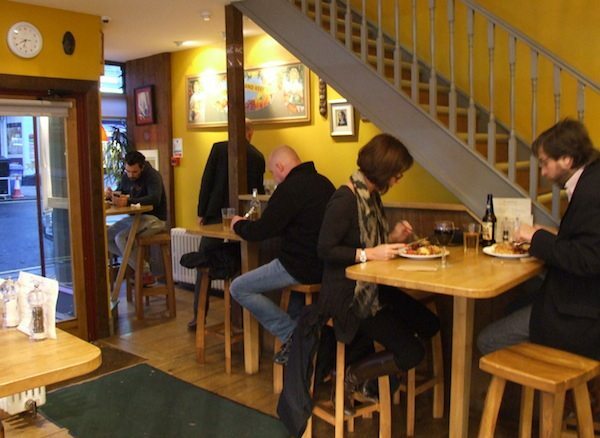 At the time of writing this review, Iydea is awarded Gold for ‘Best Café’ and Silver for ‘Best Takeaway’, at the Brighton Food and Drink Awards, which illustrates perfectly just how great this place is. I too would highly recommend Iydea for a hearty, super tasty lunch or dinner; whether you are vegetarian or not, this food is sure to satisfy any diner. I immensely enjoy every visit I make to Iydea; personally, I just don’t see how this could be done any better!